The trick to a beautifully lush lawn is the application of the right fertilizer at the right time. This guide will help you figure out which fertilizer is best for your lawn and when to apply it. 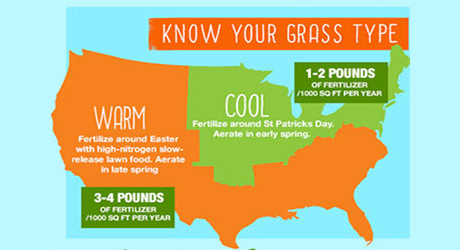 For quick and easy tips on spring fertilization, check out our infographic. Tip: Do a soil test to determine your soil’s pH level. If it’s below 5.5, add fertilizer with lime to lower the acidity, and if it’s above 7, add fertilizer with sulfur to reduce the alkaline levels. All lawn fertilizers contain three primary nutrients that are labeled in this sequence on the packaging: nitrogen, phosphorous and potassium (NPK). Fertilizers for flowers, trees, shrubs, edibles and more have different compositions, so always use fertilizer specifically designed for grass for best results. 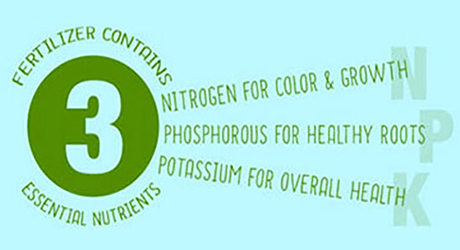 The NPK listed on a bag of fertilizer indicates the percentage by weight of each of these three major nutrients. For example, a common type of all-purpose fertilizer is referred to as 10-10-10. That means the bag contains 10 percent nitrogen, 10 percent phosphorous and 10 percent potassium. The remaining ingredients contain other nutrients and fillers. Nitrogen (N) promotes rapid growth and lush green color. Phosphorous (P) helps develop healthy root systems. Starter lawn fertilizers have a high phosphorous count for this reason, while fertilizers for established lawns have a relatively low amount. Potassium (K) boosts the overall health of your grass and helps with disease resistance, drought protection and cold tolerance. Tip: Remember these numbers by keeping “Up, Down and All-Around” in mind when reading fertilizer labels. The first number promotes “up” (rapid growth,) the second promotes “down” (root development), and the third number promotes “all-around” (overall grass health. The best time to fertilize your lawn is in the fall while grass is growing and storing nutrients. 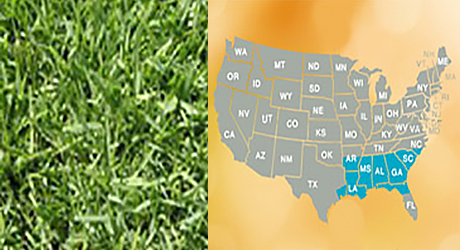 Your lawn fertilizing schedule will depend on what type of grass you have and the type of fertilizer you’re using. 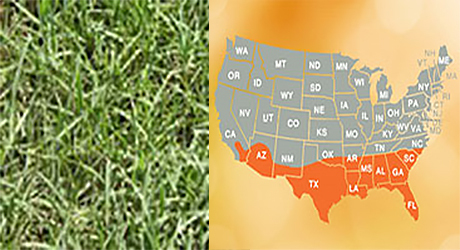 Tip: Before you fertilize, check your local weather forecast. Plan to fertilize just before a day of light, steady rain. You’ll save water and your grass will be well-fed. Early fall provides cooler weather with warm soil and ample rain, creating the perfect environment for grass to develop strong roots and grass seeds to germinate. An application of nitrogen-rich, slow-release fertilizer around Labor Day will continue to feed your lawn and provide essential nourishment for the coming spring. Second only to the fall, spring is next most important time of the year to fertilize your lawn. Spring grasses come to life hungry and ready to be fed. Fertilize your lawn as soon as the dormant grass is at least 50 percent green again. Use quick-release weed and feed fertilizer to eliminate unsightly weeds without harming your grass. Avoid using weed and feed if you plan to reseed your lawn in the same season. As a general rule, you can apply weed and feed in the spring and overseed in the fall and be safe. 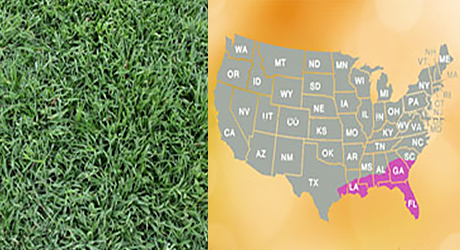 Summer is hard on lawns because of heat, drought, insects and increased foot traffic. Feeding your lawn with slow-release fertilizer at the start of summer will help keep your grass healthy and green throughout the season. This is not necessary for cool-season grasses. If insects are a problem in your yard during the summer, consider using a fertilizer with insect control. 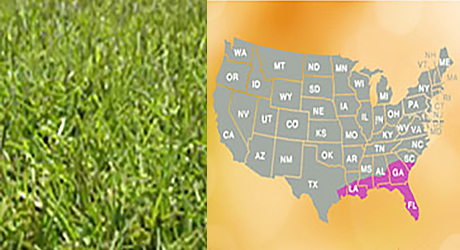 Correctly identifying the type of grass you have is the first step in proper fertilization. Warm-season grasses grow vigorously throughout much of the year and need a little more attention than cool-season varieties. These grasses grow and spread more slowly than warm-season varieties. They are typically semi-dormant during the summer, so you can fertilize just twice a year: once at the beginning of spring, and again at the beginning of fall. 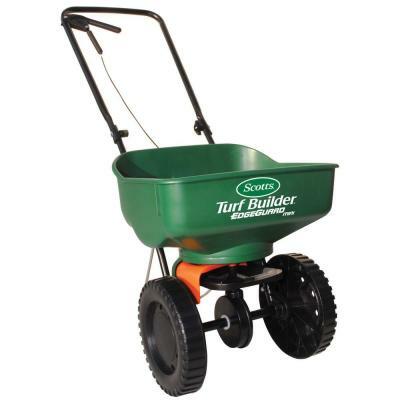 Fertilizers are typically grouped as granular, water-soluble and organic, and you can choose from walk-behind, handheld, drop and liquid spreaders to apply fertilizer to your lawn. For more fertilizing tips, check out our How to Fertilize Your Lawn guide. When trying to determine how much fertilizer to use on your lawn, a good rule of thumb is to remember that every eight steps is roughly equal to 10 feet. 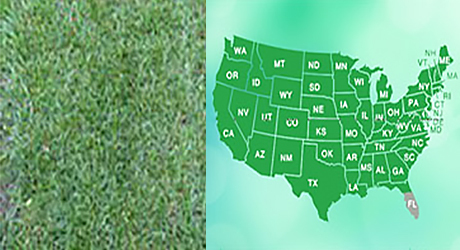 For size reference, compare your lawn to the size of a tennis court, which is 78 feet long and 36 feet wide. It helps to break up your lawn into easily measurable sections. Sketch out a rough drawing of your yard and break into into a few large squares, rectangles, circles and triangles. For squares and rectangles, measure the length and the width, then multiply those two numbers to get your area. For circles, measure half the distance across the center of the circle then multiply by 3.14. For triangles, measure the base and the height, multiply the two numbers, then divide by two. Once you have the areas determined for each shape, add up the areas to get the total area of your lawn. 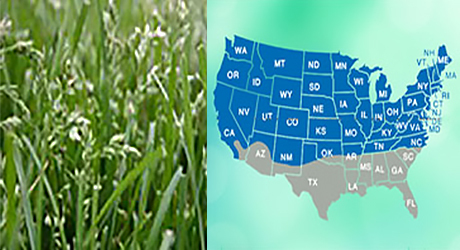 Remember that warm-season grasses should be fed three to four pounds of nitrogen-rich fertilizer per 1,000 square feet of lawn per year, while cool-season grasses need one to two pounds per 1.000 square feet per year. Also be on the lookout for fertilizers or other lawn care products that eliminate unwanted growth or bugs. Pre-emergent weed control (aka “weed & feed”) fertilizers provide nutrition for your lawn while helping to prevent weeds. 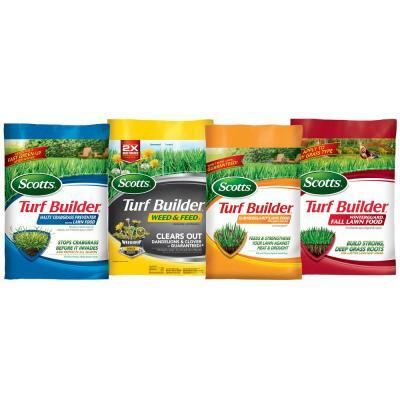 These fertilizers strengthen and encourage growth in your lawn’s roots, crowding out weeds. Quick greening fertilizers are ideal for use on established lawns and provide a nitrogen-heavy formula that brings beautiful green color to a tired lawn. Moss and fungus control fertilizers are designed to kill moss without damaging the surrounding lawn. 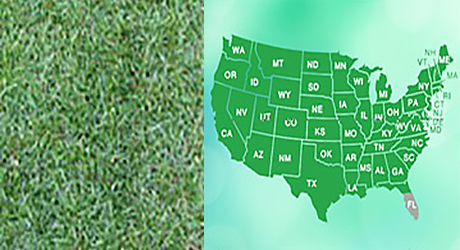 Lawn weed killer is most commonly available in liquid form, although it can be granular. 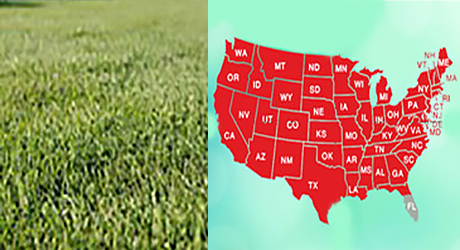 Depending on the variety, it can kill crabgrass, chickweed, black clover and other common unwanted lawn growth. Lawn insect control can be applied in both growing or dormant seasons to control harmful insects such as ants, fleas and ticks. Apply with a broadcast or rotary spreader. 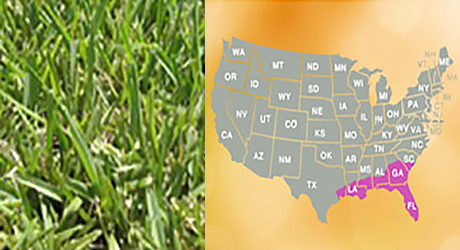 Weed and grass killer will eliminate any growth in areas you want free of plants and grass. Results are typically very fast acting. 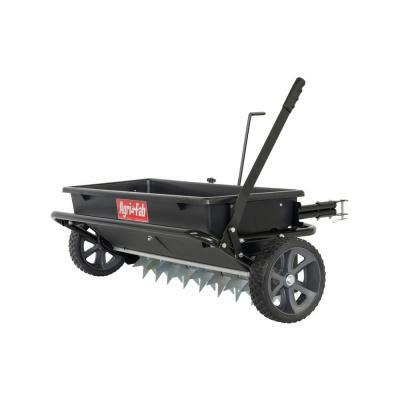 Choose from broadcast, handheld and drop spreaders to apply fertilizer to your lawn. Tip: You can find recommendations for the proper spreader settings on the label of most fertilizers. Many liquid fertilizers are available in a bottle that attaches directly to the end of a hose for convenient and quick-acting distribution. To ensure an even dispersal of fertilizer over the entire lawn, apply fertilizer in overlapping patterns. Make one complete pass vertically across your lawn and a second pass horizontally. Fertilize only when the grass is dry to reduce the possibility of leaf burn, and water your lawn thoroughly after fertilizing so that the nutrients soak into the soil. 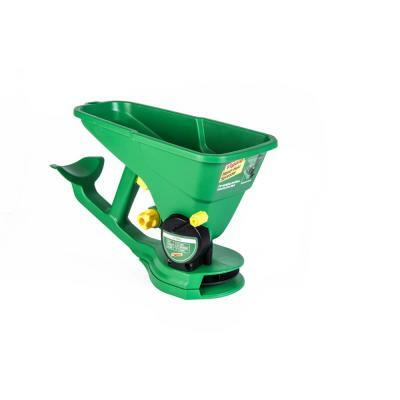 Clean your spreader before putting it away to reduce build-up of dirt and chemicals.